The Uilleann Pipes are a form of the bagpipe that is uniquely distinguished to Ireland. They are probably the most complicated of bagpipes that have arisen in Europe. The name "Uilleann" is the Irish Language word for elbow. Sometimes they, and other bellows blown pipes, are called "elbow pipes". I most often call them Uilleann Pipes because it is the term most often associated with them. Although I prefer "Irish Pipes". My Irish language dictionary gives a primary definition for Uilleann as an intersection of divergent lines. Or, simply, an angle. The second definition is "elbow". That makes more sense. The heart of the Uilleann Pipes is the chanter. The Uilleann Pipes have a "conical bored" chanter. That is to say the bore tapers from a narrow "throat" on the reed side to a wider end. Eight finger holes of various sizes and spacing are drilled in a straight line along the length of the chanter to produce different musical tones. They are covered by the thumb and three fingers of the left hand and four fingers of the right hand. The Uilleann Pipes are unique among bagpipes in that they can play two octaves (as opposed to the Scottish Highland Pipes that play one octave). They will also play staccato notes. Both characteristics of second octave and staccato notes are possible, primarily due to the chanter being played with the large end closed against a leather pad situated on the player's right thigh. The second octave is also possible because of the nature of the bore and reed. The second major portion of the Uilleann Pipes is the drones. They provide a harmonic "bed" to compliment the chanter. They are fundamentally cylindrical in bore, although most sets vary in bore width in one way or another. The drones are driven by "single reeds". This is usually a small piece of cylindrical reed cane that is cut partially across and split back to form a tongue. Many wonderful things are being done in modern pipes in regard to composite and synthetic drone reeds. Most often, composite and synthetic drone reeds are more dependable than their cane counterparts and require less air to play. There is some debate and speculation as to the origins of the Irish Bagpipe. The first bagpipes in Ireland were probably more like the Highland pipes that are now native to Scotland. This would be the ancient Irish pipes, or, what some call the WarPipes. Medieval times may have seen the development of an Irish pipe more like the Scottish Smallpipe, called the Chuisleann. This was a bellows blown bagpipe with a cylindrical bored chanter and 2 or three drones in a common stock. The current form of the Irish Uilleann Pipes may have been inspired by the Scottish "Pastoral Pipes". The pastoral pipes are bellows blown and played in a seated position. The conical bored chanter is played open along with 3 drones and (as with most examples of the instrument) 1 regulator. 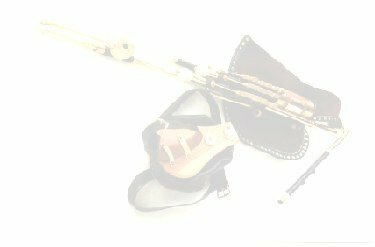 I personally believe that the Uilleann Pipes and the Pastoral Pipes may have developed simultaneously, with ideas on the instrument being traded back-and-forth between Ireland and Scotland. The major difference between the 2 being that the Uilleann Pipe chanter is played in a closed, partially staccato style. Whereas the Scottish Pastoral Pipes are played in an open, legato style. This occurred, roughly, around the 18th and early 19th century. This early form of the Uilleann Pipes was played relatively unchanged until the late 19th century. Early Uilleann Pipes (or "Union Pipes as they were called) were flat pitched. They were usually pitched around B up to perhaps C sharp. Around the turn of the century, pipemakers began to make what are now called "Concert Pitched" Uilleann Pipes. The Concert pitched set were (and still are) pitched in the key of D and are somewhat brighter and louder in tone. The development of the concert pitched Uilleann Pipes is generally attributed to the Taylor brothers of Philadelphia, PA. Again, it is more likely that several versions were developed, simultaneously in Ireland and America, with ideas making their way from one pipemaker to another. Either voluntarily or, more likely, by quiet observation.